Today is a big day — I’m formally announcing that I’m writing a brand new book on Computer Vision with the Raspberry Pi. I’ve been wanting to write this book for years, arguably ever since I started playing around with the Raspberry Pi and OpenCV. But the timing never worked out quite right. But deep down I wanted to write this book and make it come to life. On my yearly retreat in late 2018/early 2019 the stars aligned. I looked at my project plans, my commitments for the year, and took stock of my mental bandwidth. All three were a “go” — I decided the Raspberry Pi + Computer Vision book would be written and published in 2019. Since that decision, myself and the PyImageSearch team have been writing code and putting together projects for the book. To start, I haven’t finalized the name of the book yet. I’ll be sending out an email with a survey to nail down the book title in the next few days, so if you’re interested in helping to name the book, keep an eye on your inbox. After the book has been named I’ll be launching a Kickstarter campaign in mid-April 2019 to finish funding the Raspberry Pi + Computer Vision book. I fully intend on not only completing the book but also publishing it in Autumn 2019. To learn more about the upcoming Computer Vision and Raspberry Pi book, and more importantly, lend your opinion to help shape the future of the book, just keep reading. Figure 1: I’m writing a new book on Computer Vision on the Raspberry Pi. I value your opinion, as a PyImageSearch reader, more than anything else — I want to create content that you’ll not only enjoy but also get tremendous value out of. Any successful writer, entrepreneur, or business owner (especially in a highly technical field) will tell you the importance of sharing what you’re doing/building with your audience well before it’s finished so they can provide you with feedback, input, and insights. The last thing you would want to do is build a product/write a book that no one wants, uses, or reads. I’m no different — I want to make sure you get value out of everything I create. In order to make this Computer Vision + Raspberry Pi book a success, I need your help. In the remainder of this post I’ve included a rough outline/description of what I plan to cover in this upcoming book. The outline is by no means complete and finalized but I believe it does accurately reflect what will be covered. Chapters will certainly be modified and added during the writing process. Take a look at this list of topics. Then be sure to either send me an email, shoot me a message, or reply in the comments section at the bottom of this post with your feedback and suggestions. What are the prerequisites for this book? In an effort to keep this book as practical and hands-on as possible, I am trying to keep the prerequisites at a minimum. 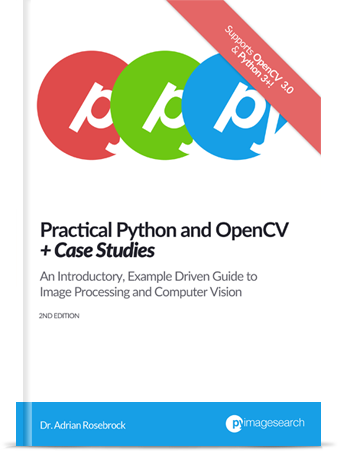 Basically, if you have either (1) read through Practical Python and OpenCV or (2) can follow tutorials here on PyImageSearch, you have all the prerequisites you need. If you’ve gone through the PyImageSearch Gurus course you’ll be able to pick up the algorithms used inside the text in a snap. And if you’ve worked through my deep learning book, Deep Learning for Computer Vision with Python, you’ll be able to more easily train your own deep learning models (and then deploy them to the Pi). If you haven’t worked through any of my books or courses, don’t worry, I’ll help get you the resources and guides you to need to be successful applying computer vision to the Raspberry Pi. Inside the text you’ll learn how to apply computer vision and deep learning concepts on the Raspberry Pi, regardless of your experience level. It doesn’t matter if you are new to computer vision or a seasoned computer vision practitioner), you will find tremendous value in this book, I guarantee that. What is going to be covered in the Raspberry Pi + Computer Vision book? Figure 2: Raspberry Pi for Computer Vision. What is the book going to cover? My general plan for the upcoming book is to focus on developing computer vision and deep learning applications for the Raspberry Pi (including IoT projects). Inside the text you’ll not only learn how to develop the algorithms but also optimize them, ensuring you get every last little drop of performance out of the Raspberry Pi. The book itself will be detailed, but also super hands-on and highly practical. If you’re a follower of the PyImageSearch blog you know that I’m a big fan of “learning by doing”. 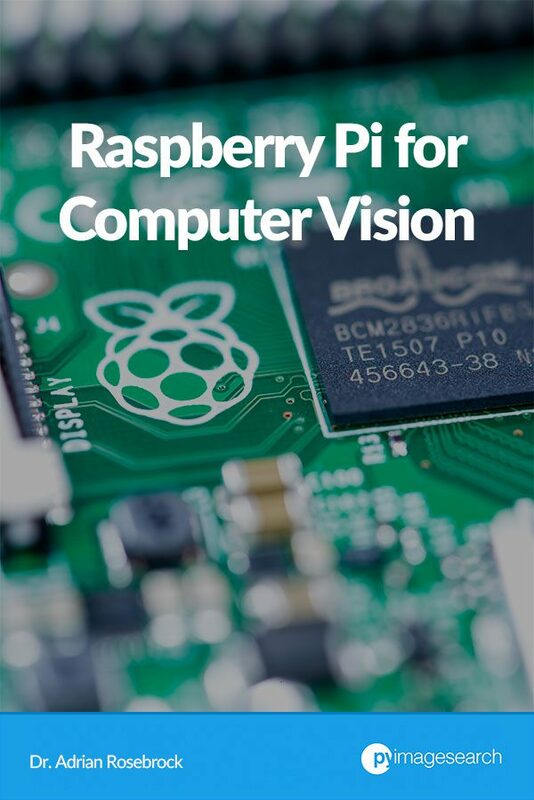 Each chapter will include highly documented, thoroughly explained source code, giving you the tools and implementations you need to successfully create computer vision projects on the Raspberry Pi. When appropriate I’ll also be including academic citations, references to current state-of-the-art work, and cross-references to other relevant PyImageSearch tutorials and blog posts. As for the structure of the book, I’ll be breaking it into “tiers/bundles”, just like I do for Practical Python and OpenCV and Deep Learning for Computer Vision with Python. This means that if you just want to test the waters of the Raspberry Pi and computer vision you’ll be able to purchase a cheaper, more affordable tier. And if you already have a good amount of experience with computer vision (or if you simply want the complete package), and want to learn more advanced techniques, you’ll be able to purchase the higher tier bundles. I haven’t fully defined where the “line” will be drawn separating the tiers/bundles (although I have a pretty good idea), but below you can find the list of topics I plan on covering. If you have any suggestions on additional chapters, please either send me an email, shoot me a message, or simply comment on this post using the form at the bottom of the page. Here is the current rough outline/set of topics I plan on covering inside the new Computer Vision and Raspberry Pi book. If you have any suggestions for topics to cover, please either (1) send me an email, (2) shoot me a message, or (3) leave a comment on this post using the form at the bottom of the page. Or, skip the install process and use my pre-configured Raspbian .img file which comes with everything you need pre-installed! Just flash the .img file and boot. Build an automatic people/footfall counter to count the number of people entering and leaving a store, house, etc. As of right now I have 40+ chapters planned out with more to come! As you can see from the outline, this book is shaping up to be an in-depth, yet highly practical treatment of using the Raspberry Pi to build computer vision and deep learning applications. If have any feedback or suggestions on the topics covered please feel free to contact me or leave a comment at the bottom of this blog post. Figure 3: The Computer Vision and Raspberry Pi book Kickstarter will go live in mid-April. I’ll be sharing more details on the upcoming Kickstarter campaign for the new Raspberry Pi and Computer Vision book in the coming weeks, but since I know I’ll get asked “Why a Kickstarter campaign?” I thought I would address it now. 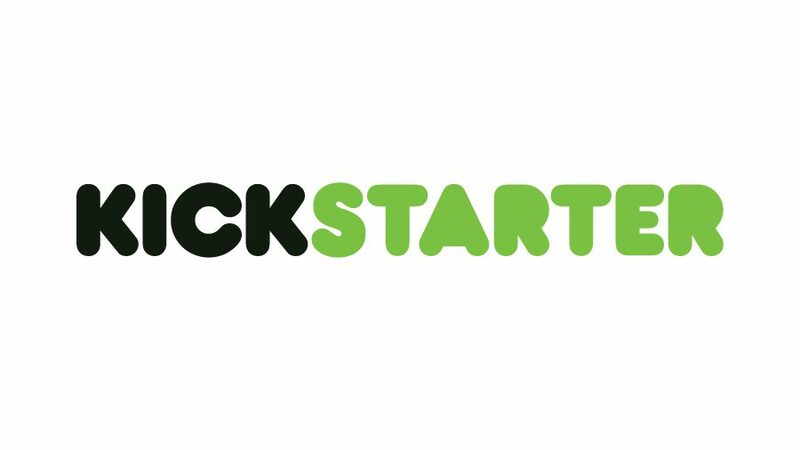 First, I’m a big fan of Kickstarter campaigns. They are a great way to spread the word about a project beyond the PyImageSearch audience. This enables me to grow PyImageSearch and ensure I can continue creating content (both free and paid) for years to come. Back in 2015 I launched a Kickstarter campaign to fund the creation of the PyImageSearch Gurus course. In 2017 I created a second Kickstarter, this one for Deep Learning for Computer Vision with Python. Both were successfully funded and completed ahead of schedule. Without the Kickstarter campaigns I would not have the funds necessary to dedicate my time to coding the examples, writing the text, editing it, and putting together the final product. In the context of this computer vision and Raspberry Pi book, I’ll be running the Kickstarter campaign to help pay for my time, Raspberry Pi hardware, server costs, and editing costs. I utilize many Raspberry Pi’s, making it faster and more efficient to put this book together (and ultimately get it in your hands faster). I’m purchasing, evaluating, and testing additional hardware for the Pi, ensuring I can give you the best possible recommendations to create successful computer vision and deep learning applications on the Pi. I have AWS/Azure cloud expenses. Some chapters inside the Raspberry Pi + Computer Vision book will utilize deep learning models. I’m training my own networks in the cloud which I will then give to you once the book is complete (but the cloud bill still needs to be paid). I have to pay for two sets of editors. It takes two editors to create successful technical book/courses here on PyImageSearch. The first editor addresses spelling and grammar while the second editor ensures the technical aspects of the text are not only correct but reproducible. The second type of editing in particular is what sets PyImageSearch apart from other websites and ensures super high quality books/courses (and that editing isn’t cheap either). I need to ensure my own time is paid for. It takes a lot of time to author a single (free) tutorial here on PyImageSearch. I put even more effort into content that I charge for (such as my books and courses). Funds from the Kickstarter will ensure that not only the book is completed successfully and on time, but that I can continue to produce free content on the PyImageSearch blog. All these expenses really add up and up until this point I’ve been putting all of the book expenses on my credit card. After authoring three successful books/courses, I can assure you, creating a high quality book is not cheap — I need the additional funds to pay for the rest of the book creation. Along with updates on the Raspberry Pi + Computer Vision book, within the next few days I’ll also be sending out a short survey to help name the book — keep an eye on your inbox, I really need your input! Everything I do here on the PyImageSearch blog is for you, the reader. Whether that’s authoring free tutorials or creating a brand new book/course, all of it is for YOU. If you see any topics that you would like to be included in the book, either email me, send me a message, or post in the comments section at the bottom of this page. I cannot guarantee that I’ll be able to accommodate all (or even most) of the requests and suggestions, but I will do my absolute best to consider all opinions/suggestions to help make this the BEST computer vision and Raspberry Pi book available today. Keep an eye on your inbox for the book title survey email, otherwise I’ll be back in a couple weeks with the finalized details on the Kickstarter campaign and book topics list. 168 Responses to I’m writing a book on Computer Vision and the Raspberry Pi (and I need your input). Good day. I am very interested in this book. Since I am working with raspberry in many directions including computer vision. Thanks Andrey, the book will definitely complement your studies. Hi Adrian! I received you message about your new book and I think this is definitely the best book about raspberries and its use! Thanks! I am waiting to read the book! Hi Adrian – great idea. I would suggest adding a section relating to connecting to cloud providers – Google Cloud, AWS, IBM, etc. They all have modules that work well with IoT devices, so it’d be nice to get your perspective on this. Also, I would definitely suggest a section on privacy and security and how to avoid being hacked. Thanks for the suggestion on cloud services, Alberto. I’ll look into that. As far as security goes, that’s really an entirely different area of computer science. Someone could write a massive book on security and privacy. A single chapter wouldn’t do it justice. With that said, I don’t think I’ll be covering that specific topic in the text. But thank you for the suggestion! This is Jay who is interested in python and rasberry Pi as well as computer vision. I am going to develop an applicaiton runs on Rasp Pi 3 B+ which detects(counts) people through a camera. It may need to detect and count up to 10 or more people at a time and I am wondering about the performance because i have to run another app on that Rasp Pi 3 B+. A simple video player(it’s just a copy of omx) and it won’t take up much of hardware resources, so the problem is that opencv app itself. I did investigation about YOLO but I heard that it won’t work well on Rasp Pi. I was not able to start the project because I am still not sure if I can get a perfect result on Rasp Pi or not. Hence,what I am going to say is that you would better to mention about what we can do and cannot do with opencv on Rasp Pi, especially because of hardware resources as well on your upcoming book. By the way, I would appreciate if you let me know the possibility of my idea. PS: I am very very interested in the upcoming book and I look forward to it. Please let me know once it’s published. I am going to learn a lot from the book. Yes, I will be discussing when and when not the Raspberry Pi is appropriate for certain tasks. I’ll also be showing you how to build people counter and tracker applications using the Raspberry Pi. Using the Movidius NCS you’ll be able to obtain the performance you desire. I’ll be doing a Kickstarter campaign for the book in April for reduced prices. The book itself will publish in Autumn 2019. It is awesome, I can’t wait to buy it. Topics are great. You could include topics regarding the use of the Raspberry Pi with the Intel Realsense cameras. I am working on projects and challenges of artificial vision and I am using images in 2D and now in 3D. Thanks for the suggestion, Alberto! PI based field crops diseases and pest recognition, wildlife alert system to reduce human wildlife conflict.Will appreciate if you could do practical systems example for solving urban challenges and Third World issues. will give more suggestions through the email. Your previous books were extraordinary and I know you will also do great job with this .Go for it. cant wait to grab one. Thanks so much for the suggestions, Abkul. Let me see what I can do on them. Good idea! I got into IoT at the same time as your blog got me interested in computer vision. Raspberry Pi isn’t my first choice anymore (though I do have several of them in my workshop) but I will definitely read how you approach things when working with a limited hardware. I’d appreciate if you added something on “what one could do if more powerful board was available”. I also work with Xaviers, TX2’s and a Coral TPU is on it’s way, so it would make me very happy if ideas for more demanding projects had a chapter or two the book. Great suggestions, Tom! Yes, I will be including content on when the Raspberry Pi shouldn’t be used and when instead a TX2, etc. should be used. I’m also getting my parents on Google’s Coral so I’ll be testing it and determining if it should be included in the book — if what I see in practice holds up to the marketing content they put out I can pretty much guarantee I’ll be covering it. That is awesome news! Definately a book I would buy. Never delved into my raspberry pi (always putting it off), but this will kickstart that journey which I have always been wanting to try. Thanks so much, Jacques — I really appreciate your support! Finally a compiled collection of Pi + OpenCV! Can’t wait to get my hands on it! Hi Adrian , that’s great ! count on me . Any estimation schedule for the release already or is it too soon ? I’ve another request if possible : it’s adding a filtering chapter maybe ? ( I’m learning the Kalman filter : it’s a clever smoothing filter to get ride of noise in tracking datas and find the smoothed estimation // I’m discovering the Hungarian filter too which combined to the Kalman filter allows to keep ID of a tracked object among several one ( if there overlap each other for example .. this filter help keeping locked each blob’s ID .. ) The Kalman filter has 3 different ‘branches’ if I’m not wrong : standard one , extended one and unscented one . Hey Clément — I’ll be doing a Kickstarter for the book in April for cheaper/reduced prices (basically a pre-order). The book itself will publish in Autum nof this year. Kalman filters are a great technique to learn but you should also take a look at this tutorial which can help you keep track of a blobs ID as well. Wow, that seems quite an undertaking! – I’ve never been attracted by all the post-processing that can be done on a camera because I prefer to do it on my laptop. Similarly, I’ve avoided applications to created time-lapse videos on my android phone and gone for saving all the frames on an sd-card and doing the creation on my laptop, and for this reason I’m not attracted by the suggestion to do it on a raspberry pi. I concede that my preference has a big overhead of storage and transfer to the processing engine. – My understanding of deep-learning is that there are two stages and the first stage, the training stage, is very, very compute-intensive and runs best on a gpu-based machine**; and that a raspberry pi is totally unsuitable. You might make it more obvious in your proposal whether this is true or not. “Movidius NCS and OpenVINO” means nothing to me. “Configure your Raspberry Pi for computer vision + deep learning” sort of sounds as if you intend to do some training. – I can think of three ways to communicate with a pi; via an ethernet cable, via wifi, and via a 3G-dongle inserted in a usb-socket. The first two are easy* and if you were to cover the third then that would be exciting and you hint at that when you write about sending texts (you do mean SMS texts?) from the pi. Even more exciting would be being able to operate the pi as a remote server over a 3G network using yaler or reverse ssh tunneling. (cd ). I seem to straying from the subject of image-processing. – It all sounds very exciting but I’m mildly concerned that it will become excessively expensive as it grows. *I wish there wasn’t such much reliance on gui-based control of Raspberry Pis. It’s very hard to find instructions on how to automate, ie use commands within scripts, to turn wifi on and off and to create a new wifi connection. **it’s irrelevant and unimportant but you write about buying gpu time to do training but I thought you had bought a large gpu-monster of your own? 1. 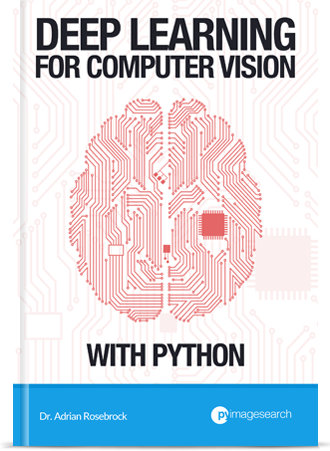 The book will be more expensive than Practical Python and OpenCV but cheaper than Deep Learning for Computer Vision with Python. I’m specifically pricing that way to help ensure hobbyists will be able to get value out of the book. 2. The self-driving car piece will leverage a bit of robotics as well so if you’re into robotics it might grab your interest. 3. I discuss how to perform on-board processing on the Pi but also how to offload the computation to a laptop/desktop as well, thereby making the Pi more of an “IP camera”. I also include my tips, suggestions, and best practices on when to do each. 4. Trying to train a CNN on a Pi isn’t a good idea — I never recommend it. Instead, the model is trained on a more powerful machine and then deployed to the Pi. The Movidus NCS can then be used to speedup inference. 5. I do have my own GPU machine but that also has to be used for other jobs as well. Hello, I have followed your posts for long as a hobby enthusiastic and I have some ideas feeded by your rasprberry DL posts. 3. In this point I have been searching a good guide to use realtime ML/DL, I have found how to setup kafka for raspberry-pc but not a good full project guide. Thanks for the suggestions, Mario. this sounds very cool. Do you have a first idea of the pricing of the books (same pricing as DL4CV?)? Will you split this book into three parts like the DL4CV book? The books will be more expensive than Practical Python and OpenCV but less expensive than Deep Learning for Computer Vision with Python. The book will be split into either 2 or 3 bundles. Noble idea to have a formalized way to present the learnings and teachings. I appreciate your effort and congratulating you for the same. I’m supporting Alessandro’s words. I would suggest to keep a nice virtual demarcation for a school goer programmer to college level to impromptu to professional programmer’s understanding. So that the book would serve all. Many a times, we read a book and in the later on we realize that it was not for me rather for someone else etc etc. I guess you must be including real life examples, at the same time give a directions for further research and optimization. Thanks for the comment, Neeraj. I’m organizing the book into “bundles/volumes” which will help readers determine which volume is best for them. For example, there will be a cheaper “hobbyist” bundle for readers just looking to hack around, have some fun, and learn something new. There will also be other bundles that progressively become more advanced, each dependent on your current skillset and where you want to end up. The book includes many practical, real-world examples as well. One of my goals for this book was to make it super hands-on and practical. Hi Adrian – Your book sounds like a great idea. For a university research project, I used your tutorials to help me learn openCV and how to use it with the Raspberry Pi. I ended up building a facial recognition garage door opener. An area to consider for your book is around security issues and how to address them. e.g. for my project I was able to use a picture on my phone and a printed picture to trick the software into believing it was me. Congrats on your university project, Kelley! 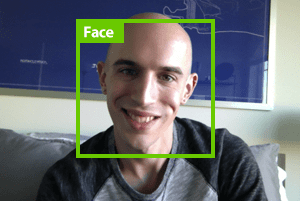 As far as face recognition goes, have you seen my tutorial on liveness detection? That would help with the real vs. fake face photo issue. It would be great to be able to include a facial recognition application that allows access, register in a file or database such access or images of authorized or denied persons and that allows bidirectional voice communication by VOIP from an app android / ios application. Finally, allow a 12V DC lock to be opened remotely. It would be a very practical and useful solution. For what it’s worth, I actually cover weapon detection already inside Deep Learning for Computer Vision with Python. Thank you for the suggestions, Harvey! one little suggestion about “Working with the Raspberry Pi”, it’s about compilation and installation. May a dedicated chapter on “cross compilation” from mac/linux to pi using docker will be a nice addition ? This could avoid hours/day of compile time. Where I work, there is tremendous opportunity to use image recognition and ML to improve QA in manufacturing. I can have some people reach out to you if you are interested in case studies. Thanks Harvey, that would definitely be helpful. Please have them reach out if you can. Wow! Really looking forward to this much needed book. The cost of the gopigo3 Robot Kit is kinda high. What about using this for as a robot base? It has 4 wheels and is bigger than the gopigo3. More space for batteries and sensors is important. I personally really like the GoPiGo3 because it enables you to take it out of the box, assemble it it minutes, and be up and running. It helps people really get used to working with computer vision + robotics. To make it’s a time/value trade off. There are cheaper alternatives, there will always be cheaper alternatives. But you spend more of your time trying to get it to actually work. My goal is to get you to the point where you understand computer vision on the Pi. What you do from there is up to you! Definitely I will support the kickstarter campaign and will buy the complete bundle. I own a copy of Practical Python and OpenCV and Deep Learning for Computer Vision and I never learned more than when I began to read both books….Once one started to read these books is impossible to stop reading. I know the quality of the books and tutorials you make and I’m sure the new book will have great knowledge. The outline is great, and just like Alberto I think that adding a section relating to connecting to cloud providers will be great too, performance of the RPI for Computer Vision inference and for what task RPI is good and for what is not. Background: on my old days (+55) I delevop a little privat projekt, before my brain is shriveling. An autonomous hexapod incl. a Realsense R200 and an spy-drone (now cheap AR2-Drone). From this point, a raspberry goes over his limit. But if you use additional ROS, the resources of an RPi3 + are sufficient. Although this requires a little more hardware (eg arduino ect when RPI runs as a master) or you use your PC as a master then the possibilities are almost limitless. Okay that goes too far in other areas. But I would like to give the impetus to that. Thanks Tyrannus! Admittedly, I don’t have much experience with ROS. I’d consider it but that would probably end up being a book dedicated to CV with ROS. Let me know about it. garden hose at anything that moves ie cats fishing in my pond. An upgrade to computer vision to detect cats rather than just movement would be great to cut down false alarms. Thanks Steve! It’s great you already have experience working with the Pi 🙂 The book will absolutely help you learn more advanced computer vision techniques for the Pi, I have no doubt about that. I mean why would someone use it instead of using a computer? Is it quicker? Is it better for proof of concepts? What would the business value be? Is it just for fun? 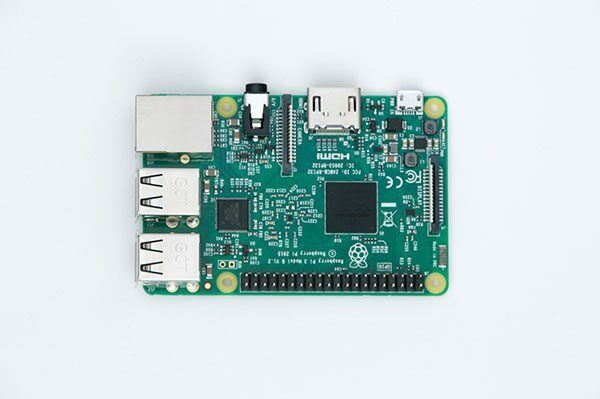 I’ll absolutely be including a “Why the Raspberry Pi” section which will not only include a discussion on the Pi but as well as when the Pi is and is not appropriate for a task. Thank you for the suggestion, Luis. Your book idea is great! I would suggest you a demo project to demonstrate how can we generate MOVIDIUS GRAPH -s with TENSORFLOW/DARKNET(YOLO)/CAFFE and MOVIDUS NCSDK ! Congratulation! Such contents is what I am waiting. Following is my personal advice. If it helps you, it is best result. 1, For Rpi is limited by Max 1G Ram, it is not suitable for training platform. So maybe users need advice to transport their projects to Rpi after training. At this time, if you show them following points, much time will be saved. — How to avoid insufficient ram. — Using external H/W accelerator (Google TPU Stick). 2, Rpi is too slow. While I evaluated POSE Model, it is about 1/10 speed of my old PC. So if user can used GPU, nnpack, Python-to-C tool to speed up, it is a big point. Hope it will be released soon! Thanks for the suggestions Rocky! It’s awesome Iam eagerly waiting for your book. I’m waiting for the book.. It will be a amazing book. Thanks Joel, it certainly will be a great one! In the chapter for the neighborhood vehicle speed monitor, could you add a little more than logging just the estimated speed? Could you add to it, detecting the color of the car, the make of the car, and the license plate, and then log all of it to a file that includes the time? This would make it easier to find the car on the video later. Plus, that would be really cool to have. The actual speed of the car will most certainly be logged. If you combine the code with vehicle make + model recognition from Deep Learning for Computer Vision with Python (DL4CV) be able to recognize the make and model as well! I love the idea! Raspberry Pi is a great route to getting CV into practical, every-day applications. The neighborhood speed camera especially struck a chord with me. It was one of the first things I though of when starting your courses. Alberto’s idea of connecting to cloud providers is intriguing too. Great list of topics already, MQTT is interesting, and I’m excited to learn about the Movidius NCS. Have you given any thought to including a bit about Julia or JuliaBerry integration? I know space is limited, but it could give Pi apps the extra oomph and the tutorial’s value could also cross over to high-performance learning on desktops where Julia can exploit GPU computation. I had not given consideration to Julia/JuliaBerry but I will now. Thanks Bill! You really have an amazing capacity to bring ideas to life and to do it so well. What makes you really special is your human, close to the reader, nature. Now your new book project: your draft of the book structure is already quite exhaustive. So just few ideas for you to consider adding, developing or simply mention (or ignore). – raspberry pi and arduino. The small microprocessor can add to the pi in many ways. – will you be talking about programs in C (I know there will be a lot of python!)? – data backup (e.g. disk image with “dd”)! – an introduction to working with database? More may come to my mind later! I also appreciate the suggestions as well. I will look into them! This is fantastic. I kept on scrolling down your content list and thinking “but what about-” only to have it answered a few lines further down. You’ve covered so many bases. I’m glad you’re also covering offloading processing to more powerful machines. That makes a lot of sense. I maybe have missed it in the list above, but will you cover stereo, 3D tracking or depth imaging when you go over using multiple cameras? We’ll be doing camera calibration which forms the basis of 3D tracking and depth imaging but the Pi is a bit too slow for some of the more advanced algorithms (such as SLAM). We’ll see what I can do there but that’s a limitation of the Pi itself. We’ll see what the Jetson Nano turns out to be which would likely be better suited for those applications. When I see your speed detection, I just imagine that we can also know how far the object from us. And I think we can combine it as early warning system when we drive a car. So people can notice how close they are with another car. And also I want to say thank you for your kindness to spread your knowledge in your blog. Congratulations for this book, Adrian! Would this be a from scratch development book on how to use Raspberry Pi + CV ? Meaning someone like myself who doesn’t know anything about Raspberry Pi but having some basic knowledge of OpenCV and Deep Learning, would it teach me all possible concepts from scratch including case studies? Great question, thanks for asking Aniket. 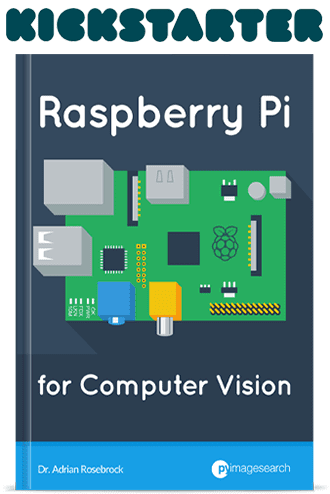 Yes, this book will teach you from scratch how to use the Raspberry Pi for Computer Vision. 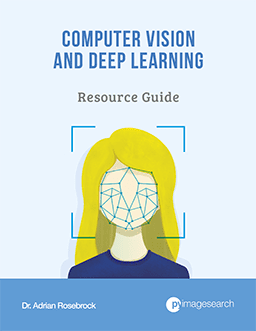 If you know the basic concepts of OpenCV and Deep Learning you will be able to follow this book and get value out of it. This is for me a must-have – these subjects are covering everything I could think of! There is one thing, however, that the list didn’t seem to include – how to boost hardware performance, or at least how to avoid that it throttles the speed for various reasons. For instance, it can be power related, and then how do you ensure that it gets enough power on battery powered applications. 2. using Intel Movidius Stick on the Pi and/or the Tx2. And having experienced both your PPAO and DLCV (reviews pending due to lack of time 🙁 ) and gaining a whole lot out of them, I am pretty sure that the book will be awesome! Thanks for the suggestions, Atif! We’ll be using multiple HATs in the book for sure. We’ll also be covering the Movidius NCS and most likely Google’s Coral. We’ll see about NVIDIA’s new Jetson Nano. Wonderfull idea. I have a suggestion, some time ago I acquired an appliance called Cluster Hat where you can do distributed programming or for example, a cluster for web load balancing. Could you include some example of how to do distributed programming and object recognition or apply artificial intelligence algorithms? Thank you very much, I see that the marriage has made you great and you continue with the same desire to teach the world computer vision. Congratulations!!!! Thanks Jose. Distributed programming won’t really help with performance on the Pi. By the time you ran a computationally heavy algorithm on a single frame across the distributed system the latency itself would be too slow, let alone the computation time. The best way is to optimize on the single board, utilize a external device (like a Movidius NCS or Google Coral), or even stream to a more powerful machine. I’ll be covering all of those techniques in the book. Looks like a great book is in sight! Could you consider a chapter on tackling the PiWars (piwars.org) challenges, as I’m sure many schools, groups and individuals try computer vision for this competition? Thanks for the suggestion, Nick. To be honest I don’t know if I’ll be able to cover that but I will give it a look and consider it. 1. Can extend gesture recognition to real-time interpretation and transcription of sign language. 2. Using TensorFlow Lite on the Raspberry Pi. 3. Door entry system fitted with a fingerprint reader: fingerprint is processed on the Raspberry Pi. 4. Are you being sponsored by Intel to feature Movidius NCS? Why extra hardware if you can do it on the Raspberry Pi? Need to justify why Movidius NCS. 5. Someone mentioned USB 3G dongle. Support this example. 6. Mail delivery: more easily done with an Arduino and basic sensors: no need for a camera or RPI. Beginners should be taught not to “over engineer”. Thanks for the suggestions! And no, I am in no way sponsored by the Movidius NCS. The NCS is used to help with deep learning, mainly for faster inference (prediction). I’ve covered the NCS a few times on the PyImageSearch blog already. I would refer to this tutorial and this one for more details on the NCS. means, we’ve seen many and I’d say hundreds of nice and accurate codes shared by you which are all good for most of the study and research purpose. But for e.g. if I’ve to deploy an object counter (like people’s counter) in a real environment where the code should run out of the box on boot; then what things should be considered and related article. Including any GUI perhaps? Great idea, look forward to reading it. I’m a starter so perhaps add a basic introduction to guide us beginners to the more sophisticated aspects. If you’re new to computer vision and OpenCV at a bare minimum I would recommend reading through Practical Python and OpenCV so you can learn the fundamentals first. Dear Adrian, thank you very much for this idea! Thanks for the suggestion! I can promise you that every example in the book is very hands-on, practical, and relates to everyday life use cases. If the chapter wasn’t related to everyday use cases I decided to exclude it. All the best for new book. And, Please add Raspberry pi using GPU (Optimization) as well. We’ll be learning how to use OpenCL to distribute across cores. For actual optimization for DL models (outside of OpenCL) we’ll rely on using the Movidius NCS and hopefully Google’s Coral as well! Other optimizations will be included throughout the book too. I’m very interested in Image processing, i hope you’ll complete it soon. Will you be covering the FPGA so that adoption of AI and deep learning can be accelerated in this sector. Another great expectations is on the inclusion of how to deploy the applications. An example on implementation of a combination of CNN + LSTM where the input will be remotely accessed images. Will you be including LoRa + PI based deep learning examples? please don’t forget implementation on PI zero. The wish list is too long BUT WE ARE CONFIDENT THAT YOU WILL HANDLE IT. Thanks for all the suggestions, Abkul! I cannot guarantee I cover all of them but I will definitely consider them. Also, given that rpi content is easily adaptable to other low cost Arm sbcs, it would be interesting also to see the performance of intel movidius (and maybe the new google edge stick) on an sbc with usb3 port, where the USB is not limiting the performance. Thank you for the suggestions, Memeka! Sounds like a great book for someone like me who is building a remote controlled rover with surveillance camera on a gimbal. I’m very interested in making progress in this direction once I get a few glitches fixed. I’m also interested in volunteering to proof a copy, since I’m an English major. This is fantastic news. I have mentioned before that I initially discovered Pyimagesearch as a result of having difficulty with the SimpleCV tutorials in the “Make: Getting Started With Raspberry Pi” book. These issues were mainly code and version based discrepancies and quite frustrating to a beginner of any age. My motivation to learn Python and OpenCV with the Raspberry Pi has been to up-skill myself to a point to where I can get my 13 year old son up and running. It was clear that the existing books and tutorials were going to be more of a barrier than a help – that is until I came across you tutorials and style of knowledge sharing. My question is whether you have considered the education sector as a key audience? Specifically secondary school level, as I see a significant opportunity to get a quality training resource into a very capable student base. I think that your book could be a huge success adapted as a course. I do not have a teaching or training background so I do not know what the undertaking would be to develop such a course however, if this could be done in parallel to the development of the book, I think that it could be a great success for the students and teachers as well as growing the Pyimagesearch network and brand. Thanks for the comment, Matt. Are you referring to in-person live training done by me? Or simply adapting the contents into a course that others would teach? It would be fantastic if you could personally teach however I genuinely believe that you could provide contents for a range of courses that could be rolled out to classrooms globally. I think that they would be of significant interest to students of a wide range of ages – probably 15+ however, I think there are some very capable and interested students of a younger age also. The manner in which you constuct you current tutorials and publications makes it so a lay person / hobbyist like myself can quickly pick up complex topics and then execute the code. My previous attempts using a wide range of other books and sites had proved very challenging and frustrating. If you had someone with teaching and course preparation experience to work alongside you as you develop the book I think that this would be a greatly complimentary exercise and potentially have significant commercial benefit. Courses or not, I look forward to purchasing the book. If it’s half as good as the last book then I’m sure it will be great. I’ve done some remote wildlife monitoring, the Pi power consumption (and boot time) will be a hurdle, I’m interested in seeing how you manage it. You want a < 1 sec trigger speed for video capture. Also as a returning customer……discount? The content is quite exhausting. One thing I would take into consideration is to include a chapter or two on Google Edge TPU coprocessor (https://coral.withgoogle.com/products/accelerator/) as an alternative to the Intel Movidius. Thanks for the suggestion Jarek, I will try to cover it! Awesome work, Adrian. I’m truly looking forward to your book. The industry that involves microcomputing emerges to grow fast. Along with the Dev Board, Coral has a USB Accelerator as well like Movidius NCS. It would be an exciting experience for me to run your projects on those platforms also. Thanks David, I’m going to try to cover them in the book! I’d like to also be able to read a discussion about the equivalent of ‘deep sleep’ of the Pi until some peripheral device wakes it up to an event so that it can do its stuff and start burning power. Lets say a small BT device with a sensor detects intrusion which in turn wakes the Pi. I realise this will involve the use of other I/O pins, but perhaps the pros and cons of using a microcontroller vs an SBC, and how they can combine would be useful to some. Great. I have been working on a raspberry pi object detection project for 3 months now. I look forward to read this book. Adding Movidius stick will help me, I’ve signed to Twilio account to have the Pi send me text when a s pacific object is detected, any other ideas, or code to do communication when an objected is detected would increase my knowledge base. Setting up an Azure VM to train a model and deploy to the Pi took a long time to figure out. It would help to explain the steps in the book. Thanks for taking up on this project. I’m looking forward to the book. I am interested in more industrial applications, specifically detecting labels on items in a warehouse and either decoding the bar code or using OCR to get the number. Which would be more reliable or quicker? Also, since I can control the printing of the label, what characteristics could I include on the label that would make it easier to find and decode from the greatest distance? Thanks for the suggestions, Fred! Might I suggest you expand the Movidius NCS section a bit to include Google’s new Coral TPM USB Accelerator. Supports the Pi and price competitively with the Movidius. I just got one from Mouser and the software install couldn’t be easier. Another enhancement might be to include some info for the Pi-like products — Odroid XU4 — adds Gigabit Ethernet, USB3 and eMMC boot option, and perhaps the others Banana Pi, etc. I look forward to the bood! I would love to cover Google’s Coral TPU USB accelerator 🙂 Thanks for the suggestion, Wally. Congratulations on the idea of the book, the IOT line for ARM as raspberry are definitely needing the ability to use a GPU like Movidius, although raspberry has a GPU but there is no free code yet available to use it at a high level of programming. It would be very interesting in the bookshop to have a section dedicated to the portability of the code under ARM architectures such as Rock Pro, Google TPU edge and others. Thanks so much for the suggestions, Felipe! All the best @Adrian for this awesome project. I am eagerly looking forward to buy it. Please keep the price of this book as much as less you can. Thank you for filling in your valuable time. I think your book can be a good guide for taking advantage of these small devices. Rasp Pi + Movidius is also a good combination, but I would also like to share information about other SBC / accelerators you have experienced. Thank you for writing good books and blogs. Thanks for the suggestion, Mic! It’s great news! I can’t waiting! Thanks so much for the suggestions, Clark! * will you teach RP and CV at the same time? If yes, as potential buyer please cover given topics A-Z, nothing infuriates me more than reading “ok, those 5 sentences are everything, google for more”. As newbie to RP I would expect in such case I will be lead by hand and book will be the only source of the info. If not, RP is just a platform, and you focus on CV, in such case assume reader is versed in RP and don’t waste time on half-hearted introduction to RP. * timeline — how long this book will be? 400 pages? 700 pages? IMHO the first is doable in case of CV only (+RP as just a platform), the second in case you teach both at the same time. Just pick 400, say autumn is October, 7 months for writing + publishing, something like 60 pages a month, it does not look much but you have to take care of proofreading, polishing the book so the first written words are the same quality as the last ones (no wear-off effect). I am with you, but I don’t think it is doable, 700 pages even less likely. I am not saying “don’t write book”, quite contrary, but don’t put high expectations upfront. Prepare for worst, have high hopes. Thanks for the comments, Macias. I’ll be covering the topics as in-depth as a reasonably can. I have never sad (and will never say) “Google for more” in my books/courses. Instead what I do is provide citations to my tutorials on the PyImageSearch blog (so you can read them at your inconvenience) followed by references to other books and courses, just in case someone is super interested in a sub-topic and really wants to learn more. The book will definitely be self-contained, meaning if you buy it, you don’t need anything else — but I do naturally cite other sources as that is just good practice when writing. Could you please include some material on using Google AIY Vision Kit for installing and running OpenCV. Thanks for the suggestion, San! The PI world has a huge installed base. I have six in various versions and installations. This includes the Google DIY Vision Kit (Movidius). Nvidia, as we all know is shipping its Jetson “Pi’ board in April at a 100 bucks. I’ll get one to see what it can do.. The Pi iis at the end of its product life. (I’m sure next gens will be “mostly” (my cynicism) compatible.I have your Python CV book and am a happy customer. Having done five startups, including a successful image processing company, I can say this this is the first questions investors ask. I’d like to see the book complemented by an software environment that allows headless and seamless development with my Windows / GPU system. Thanks for the comment and all the suggestions, Bill. I’ll also be covering my best practices on how to configure your dev environment and work on a headless Pi. I’m looking forward to getting my hands on this book. I’m in this waist deep now at work and I am so thankfully for your knowledge and sharing; has helped me out in so many ways. It will be nice to have all of this captured in one body of work. 1. Please consider the lower income of countries. Your books are very very expensive. 2. Implement ANPR with Image Processing methods. 3. Implement ANPR with Deep Learning methods. I am a huge fan of your work. I follow your tutorials, I also own a copy of both of your books “Practical Python and OpenCV” and “Deep Learning for Computer Vision”, plus I purchased your “Computer Vision Guru Course” and I have learned a lot from them. My advise to the Pyimagesearch readers or potential people interested in your upcoming book, is to go for it. I am a PhD student in Computer Vision and Machine Learning, and I have made tons of progress just by reading and going over all the material offered by Adrian and Pyimagesearch. The content is very practical, so I can set up many experiments quickly, and truly concentrate on the outcomes and results. The material is presented in clear ways that are understandable for any type of audience: beginners, intermediate and advance. At the end, you only learn by doing, and the most experiments or applications you do, the more versed you will become at CV, DL and RPi. Certainly the book will help a lot. I supported the “Deep Learning for Computer Vision” kickstarter campaign, and I will definitely support the upcoming campaign. To be honest with everybody, I wasn´t confident at first to support the kickstarter campaign because I was paying for a book that I didn´t know how good it was going to be. Once the book was published, I got what I was promised and even more, so I will do it again for this new book, it is worth every single cent. – CV applications in Drones using the Raspberry Pi. – Building chatbots as a complement for the home surveillance applications. I will send you an email with other ideas. Keep up the good work Adrian. Thank you for the suggestions as well — I’ll see what I can do! Hi Adrian, book topics sounds great. While covering MQTT kindly make sure to to add examples on how to send images and video to remote server. Thanks. it’s just perfect. i’m impatient to see the content. you’re really magical. thanks a lot. keep up.